Every time I go to the grocery store, Mathlete asks me to buy bananas. Most times, we eat all but one or two which then get overly ripe and no one wants to eat them. 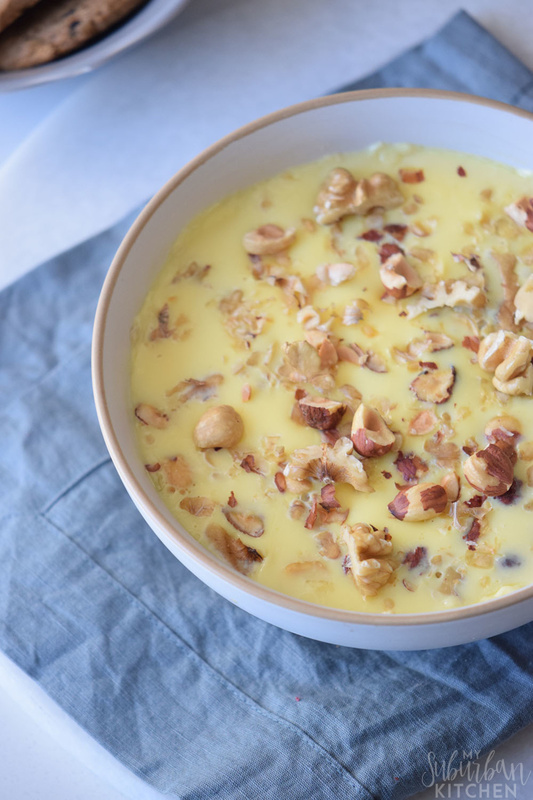 Those bananas are perfect for making banana walnut pudding. Once turned into a delicious pudding, everyone suddenly wants in on those bananas. 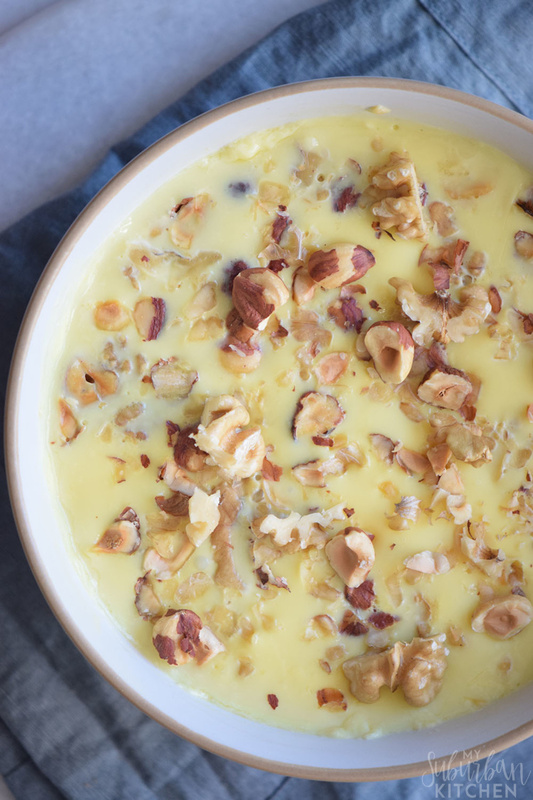 I make this pudding and keep it in the refrigerator for a little sweet treat after dinner. 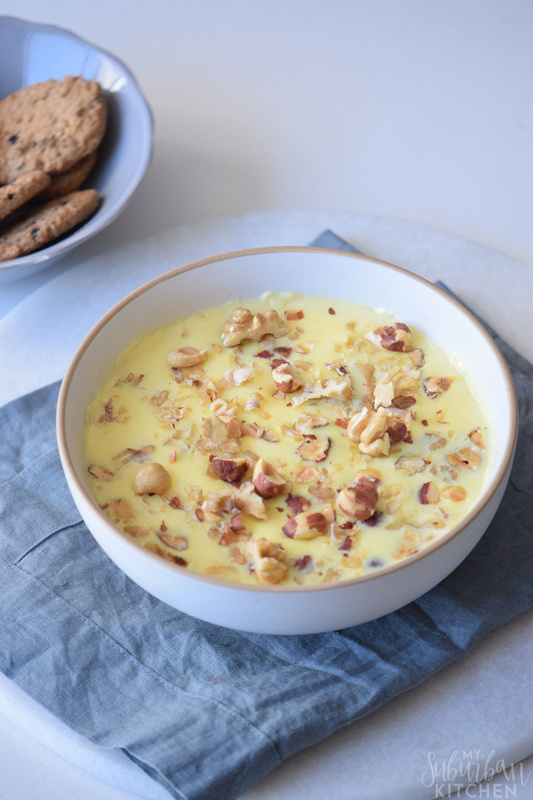 It has a custard like consistency which tastes so delicious. I usually use my salted caramel sauce in it but any caramel sauce will work great. Just choose your favorite. 1. In a large saucepan over medium heat, whisk together the mashed bananas with the sugar, flour, baking soda, eggs, cinnamon, nutmeg, vanilla, and milk. Whisk for 2-3 minutes or until mixture begins to slightly thicken. 2. Continue to whisk mixture and add in caramel sauce. 3. Remove from heat and fold in walnuts. Pour into serving bowl and refrigerate for at least three hours. Top with chopped hazelnuts just before serving. 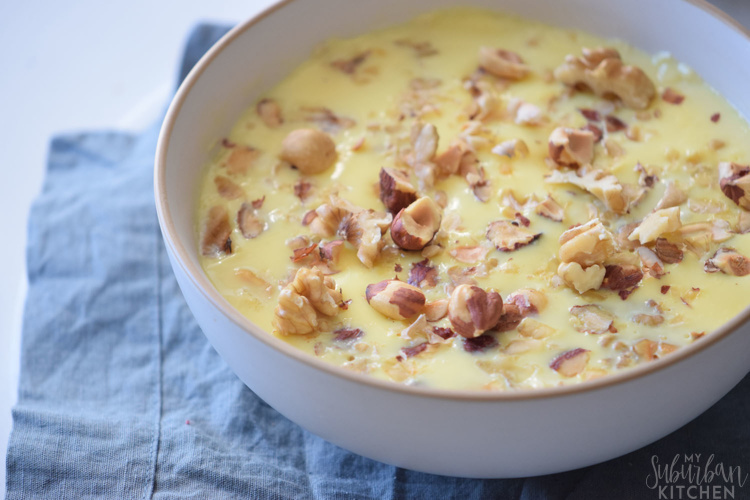 I love adding the chopped hazelnuts and extra walnuts on top of my pudding. Feel free to substitute almonds or any other nut if you prefer. What are your favorite sweet treats? How do you use up overly ripe bananas that no one in the house wants to eat? In a large saucepan over medium heat, whisk together the mashed bananas with the sugar, flour, baking soda, eggs, cinnamon, nutmeg, vanilla, and milk. Whisk for 2-3 minutes or until mixture begins to slightly thicken. Continue to whisk mixture and add in caramel sauce. Remove from heat and fold in walnuts. Pour into serving bowl and refrigerate for at least three hours. Top with chopped hazelnuts just before serving.